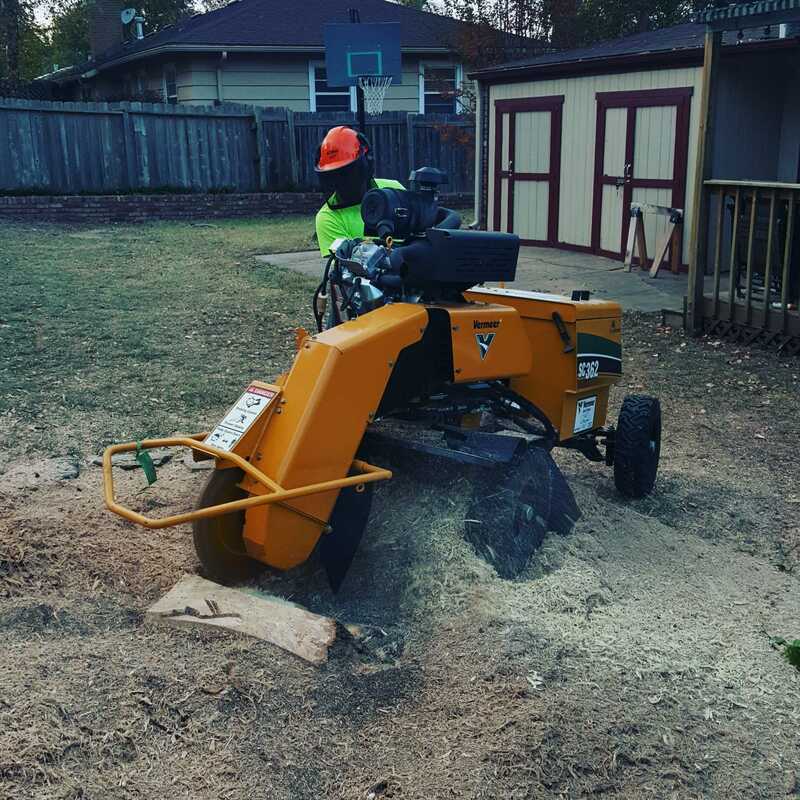 Stump grinding by Wichita Tree Service employee. One of the main services Wichita Tree Service offers is stump grinding, we can help you to remove that huge dead stump in the middle of your yard. The stump that you have turned into a patio table or have tried to hide with flower pots and squirrel statues can be gone in a matter of minutes. We will use our new 35 HP Vermeer SC362 Stump Cutter. We have used this machine after cutting down some of the largest trees in Kansas. Whatever your trees need, we can help. No longer will you have to mow around the stump that has been an unwanted part of your landscape for so many years. Our stump grinders will fit through a 36 inch gate to easily access stumps in your back yard. The professionals at Wichita Tree Service guarantee that there will be no traces of your old stump. Debris can be removed and topsoil can be brought in to fill the hole that stump once occupied. No ruts left in the soil after the stump grinder has done its job because of the stump grinders lightweight. Our smaller Toro stump grinder can also be used to complete jobs that other companies cannot access. It is small enough to be carried to difficult locations and even maneuvered through a building. We even recently lowered it into a hole to remove a stump that was at the bottom of the hole. All of our equipment is well maintained and equipped with the latest safety features to prevent injury or damage to your property. 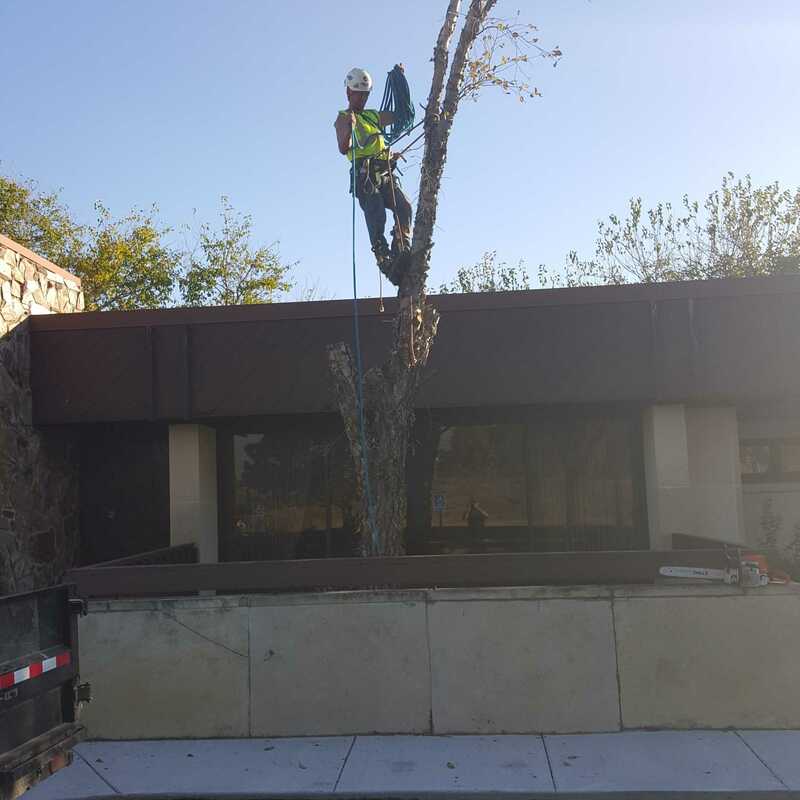 Tree removal and stump grinding of a tree growing in from the basement level of heartland dentistry. We had to carry the stump grinder through the building to get to the stump. Wichita Tree Service charges $4.50 per inch, based on the diameter of the tree stump. Hard to access tree stumps may be priced at a slightly higher rate. we can also remove the mulch leftover from the stump grinding process and add topsoil for an extra charge. Most companies charge around $4 to $6 per inch to grind a stump. 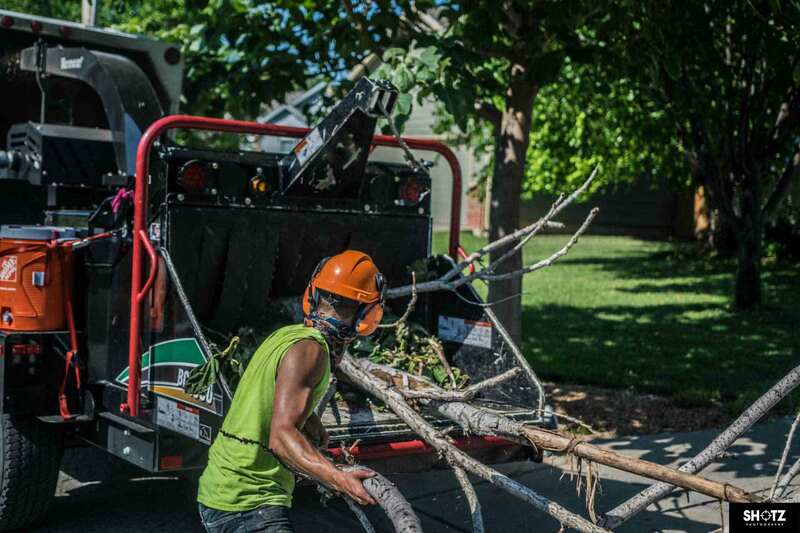 Many tree service companies do not own their own equipment. They may charge extra to cover the cost of the rental and may be less familiar with the safe operation of the stump grinder. Some companies will not have a stump grinder that will fit in gates and will charge more to do stumps in backyards and will leave large ruts because they might have to back a truck in the yard. 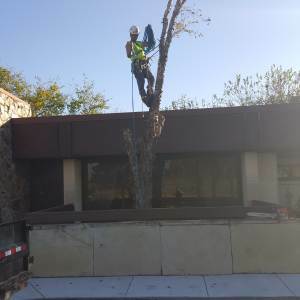 If you decide to have a tree removed by Wichita Tree Service, we will gladly give you a discount on removing the stump as well. We also offer a discount for multiple stumps. -will the machine leave ruts in the yard and can they get in the backyard without taking down the fence? Want to remove a stump yourself? Removing a stump by yourself will require you to rent a stump grinder. Home Depot has a smaller 13 HP stump grinder similar to our smallest stump grinder. which you can rent for around $80 to $100. This machine will give you a workout but will be a little cheaper than a large machine. You can also rent a smaller 25 HP stump grinder from many rental yards here in Wichita for around $100 for 4 hours and $200 for the full day. Be aware that the cutting teeth on these rental units do not get sharpened after each use and are often dull due to people hitting things other than stumps (rocks, concrete, metal, etc.) Consider getting a bid from Wichita Tree Service before you tackle this job on your own. We may just prove to be the safer and more cost effective option. Wichita Tree Service is a tree service, unlike any other. by refusing to practice improper pruning and educating customers about their trees our goal is to sustain the health and well being of our urban landscape for many generations to come.